Austin Riley (left), Touki Toussaint (center) and Kolby Allard (right) all had strong performances on their Triple-A debuts with Gwinnett in 2018. (Riley and Allard photos by Will Fagan, Toussaint photo by Bob Chadwick). LAWRENCEVILLE, Ga. - The Atlanta Braves announced their 2018 Minor League Award Winners on Saturday, September 15. 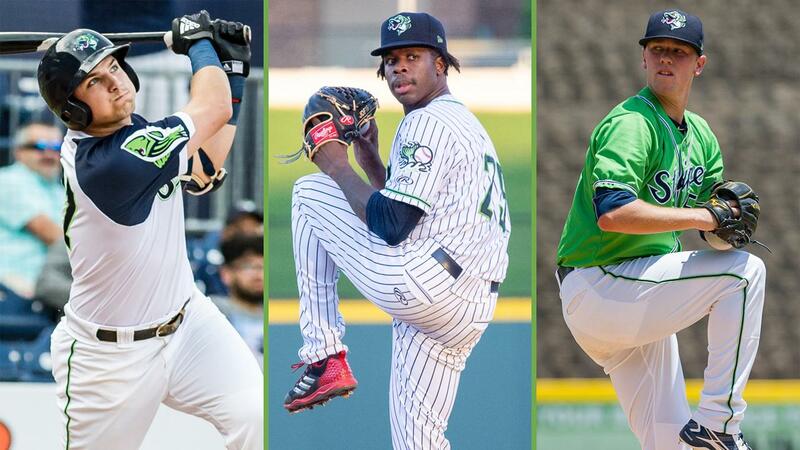 Gwinnett Stripers' third baseman Austin Riley received the Hank Aaron Award for Braves Minor League Player of the Year, while former Stripers' right-hander Touki Toussaint received the Phil Niekro Award for Braves Minor League Pitcher of the Year. Riley was also named Gwinnett's Player of the Year, while left-hander Kolby Allard was named Gwinnett's Pitcher of the Year. It is the first time Gwinnett players have received both the Aaron and Niekro Awards for the same season since 2015, when outfielder Mallex Smith and right-hander Tyrell Jenkins both earned the accolades. Riley, 21, combined to bat .294 (120-for-408) with 30 doubles, three triples, 19 home runs, 61 runs scored, 70 RBIs, a .522 slugging percentage and an .882 OPS over 108 games between Gwinnett, Double-A Mississippi and the Rookie-level GCL Braves. Over 75 games on his Triple-A debut with the Stripers, he hit .282 (82-for-291) with 17 doubles, 12 homers, 41 runs scored and 47 RBIs. On May 13 vs. Norfolk, Riley set career bests and tied Gwinnett single-game records in both homers (3) and RBIs (8), going 4-for-5 to lead the Stripers to a 10-0 victory. He ended the season on a hot streak, ranking tied for first in Minor League Baseball with seven homers over his final 16 games from August 21 to September 3. It is the first Hank Aaron Award for Riley, the Braves' Competitive Balance Round A selection (No. 41 overall) in the 2015 MLB Draft out of DeSoto Central High School in Southaven, Miss. Toussaint, 22, led all Braves' minor league pitchers with a 2.38 ERA (36 ER in 136.1 IP) and ranked tied for eighth in MiLB in strikeouts (163), going 9-6 in 24 starts between Mississippi and Gwinnett. He posted the second-lowest ERA in MiLB after June 1, a 1.33 mark (12 ER in 81.0 IP) that trailed only Patrick Sandoval of Mobile (1.16 ERA, 10 ER in 77.1 IP). After joining the Stripers for his Triple-A debut on July 5, Toussaint went 5-0 with a 1.43 ERA (8 ER in 50.1 IP), a .193 opponent average and six quality starts in eight outings. His 1.43 ERA was second-lowest in the International League from July 5-September 3, behind only Kyle McGowin of Syracuse (1.20 ERA, 7 ER in 52.2 IP). It is the first Phil Niekro Award for Toussaint, who was acquired by Atlanta via trade with the Arizona Diamondbacks on June 20, 2015. Toussaint was also named Mississippi's Pitcher of the Year for 2018. Allard, 21, ranked third among Braves' minor league pitchers and third in the IL with a 2.72 ERA (34 ER in 112.1 IP) over 19 starts on his Triple-A debut with Gwinnett, going 6-4. He led the Stripers with 11 quality starts and also ranked among IL pitching leaders in WHIP (5th, 1.21) and fewest baserunners per 9.0-IP ratio for starters (5th, 11.06). Allard made 10-straight quality starts from April 28-June 21, going 4-1 with a 2.17 ERA (16 ER in 66.1 IP) in that span. He was selected to the 2018 Triple-A All-Star Game, but did not participate. It is the first Gwinnett Pitcher of the Year Award for Allard, the Braves' first-round selection (No. 14 overall) in the 2015 MLB Draft out of San Clemente (Calif.) High School. Allard (July 31 vs. Miami) and Toussaint (August 13 vs. Miami) are two of 12 Stripers players to make their Major League debuts with Atlanta this season. Both are currently with the Braves.